As the Mets move toward completing their plan and becoming a playoff contender in the 2015 season, there are still many questions regarding the team. Can Noah Syndergaard play up to his nickname, Thor, in his first season in the big leagues? Can Rafael Montero improve upon what was a lackluster debut in 2014? 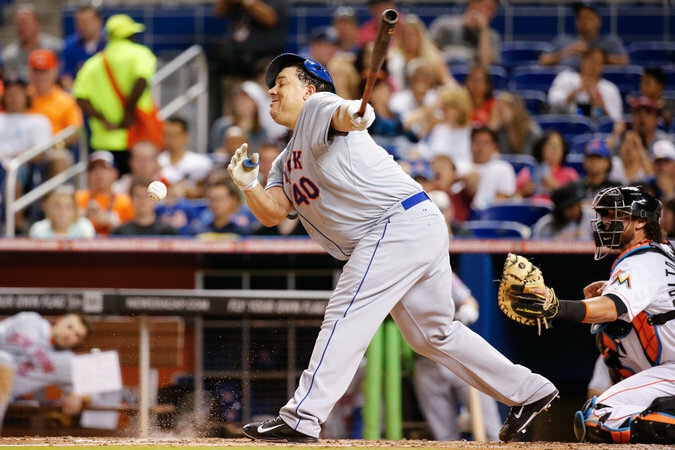 Can Sandy Alderson find a left fielder who can hit/isn't named Young? Is Daniel Murphy going to continue his All-Star level of play? My answers: yes, yes, yes, and no. Photo courtesy of New York Times. Then, there came the point where Collins began to bat the pitcher's spot eighth, because of the myth that it was better to have speed at the bottom and top of the lineup. It makes sense to do this when your pitcher is actually a better hitter than the position player who otherwise would be in the eight hole, such as when Jacob deGrom is displacing one of the Youngs at the bottom of the order. But, it's a completely ridiculous tactical decision when a poor hitter like Jon Niese is hanging out in the eighth spot, allowing him to potentially get an extra at bat at an important juncture of the game. Either the pitcher would record a costly out, or Collins would have to take the pitcher out prematurely in favor of a pinch hitter. There's a reason why the worst hitters bat further down the lineup. We all know by now about Collins and his terrible mismanagement of the bullpen. Either he leaves his pitcher in too long, causing them to lose effectiveness and give up unnecessary baserunners and/or runs before finally exiting the game. Even when it becomes clear to everyone watching the game that the pitcher needs to be removed from the game, but Collins puts a lot of senseless faith in their ability to work themselves out of a particular jam, only for them to dig an even bigger hole for themselves. And conversely, Collins sometimes makes up for those mistakes by using a very quick hook, taking out his pitchers too early, when they're still going well and have the chance to eat up some more quality innings. He's always too worried about doing things by the book, because that's how it's always been done, rather than make changes according to the new information that debunks the long-standing "conventions" of the sport. We now know that speed at the top of the lineup doesn't matter nearly as much as getting on base. It should be painfully obvious that lefty-lefty matchups don't matter at all when the lefty reliever being used struggles to retire major league hitters, regardless of what side of the plate they stand on. I'm looking directly at you Scott Rice. He misuses players, and allows guys like Eric Campbell, Andrew Brown, or, last season, Josh Satin to get promoted from AAA while on a hot streak, only to sit on the bench for the next week and appear intermittently as pinch hitters in favor of giving more playing time to Chris and Eric Young, two players who have proven time and time again to be bad hitters. Unfortunately, the man in charge doesn't notice these simple things, and refuses to make the necessary changes that should improve the team. To put it lightly, I'm not pleased with Collins and his job as the Mets manager, and I'd like to think that not many people are. The case for keeping Collins around, is to maintain continuity. The Mets are a growing team. The team's best young players are slowly matriculating upwards through the organization, from Port St. Lucie, to Binghamton, to Las Vegas, and finally, to the major leagues. As prospects advance, they have to adjust to new cities, new teammates, and new coaches. Despite everyone working together in the end, on a day to day basis, the culture in each of those places is controlled by different people. Players have to worry about enough, with having to move to new places, and constantly travelling, as well as adjusting to new teammates and coaches. It would be even harder when those new coaches were replaced by a different group of coaches so soon. The best situations for young players are always the ones that are stable. The culture of the team is already established, and no one has to deal with a revolving door of personalities all trying to find their footing, no matter where they sit on the hierarchy. Constant turnover in the clubhouse and the front office is bad when dealing with a group of players who are still developing themselves into bona fide major leaguers. Keeping Collins as the manager of the team would be simply because of the old adage: if it ain't broke, don't fix it. The Mets are trending upwards, so why in God's name would they fire the manager who's been a part of the rebuilding phase for so long? Because that would be the best option for the team. The strategy that one needs to have when running a team is actually, if it ain't broke, make sure it stays that way. By remaining complacent and keeping Collins aboard simply because that's how things are, compromises the team's ability to make the playoffs next year, and in subsequent years as the roster slowly but surely improves into what should be, dare I say, a force in the National League. The reasons why Collins would keep his job this winter would be the same reasons that kept Dusty Baker employed for so long despite being a subpar manager in San Francisco and Cincinnati. Just because a manager is leading a winning team doesn't mean that the manager is the right man for the job. If Collins isn't the guy who will maximize the potential that the Mets have in their system right now, he needs to go. As for his replacement, it remains to be seen. Wally Backman has done just about everything right since joining the organization in 2009, when he managed the Brooklyn Cyclones to the best record in the McNamara Division. Since then, he's moved up to Double-A Binghamton, and now to his current job, managing the Mets' Triple-A affiliates, the Las Vegas 51s. He's been getting rave reviews from everyone on the outside of, and within the organization. It seems like just about the right time to bring him up to take over the big club. Even if Backman flops as manager, it was worth the risk. There are plenty of capable managers out there, and it's up to the team's front office to find the right one. And we already know that Terry Collins isn't the right one. Copyright 2011 by William Botchway. Picture Window theme. Powered by Blogger.